Review: This one took a while to get into because the setting was so different in the beginning. I wanted Claire and Jamie not what I was reading about. Eventually the setting changed but it took me a year to pick it back up again (oops!). The ending is a heart ripper outter. Holy! This is such a great series. I can’t believe that there are so many books that I can enjoy and get lost in. The beginning part set in Claire’s “present” day it was confusing and I didn’t much care for the characters that were introduced. It also didn’t make sense why until the end of the novel. We could have really done without this part but I see how it made the last few lines in this book very heartwrenching. I need to start Voyager now! I will always leave a comment on everything Outlander related because I just loooove the series. I totally get what you mean by reading stuff that you didn't care for because I too was like 'Claire and Jaime, gimme meeee'. I think some of the pages were filled with such along discriptions that I kind of skimmed them instead of proper reading. I'm on the 3rd book and it's taking me a bit getting into it because it also has a lot of parts without Jaime/Claire but I won't spoil it for you. Outlander… anytime I see an Outlander post I am drawn right in. 🙂 The books are so huge that sometimes it does feel like it takes forever to get things going. 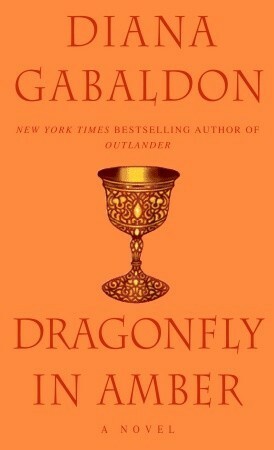 Like the beginning of Dragonfly in Amber. The setting in France made this one feel so different from Outlander. But that ending. Oh my heart. It's been years since I read it and I still remember how emotional it was!